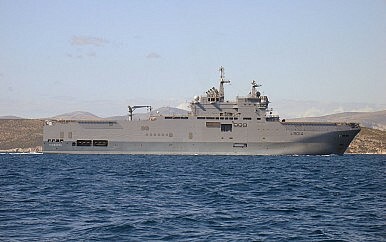 A French warship that had previously visited Vietnam's Cam Ranh International Port. Nguyen Phu Trong’s official visit was just the latest in a series of interactions meant to boost bilateral ties. Last week, Nguyen Phu Trong, the general secretary of the Communist Party of Vietnam (CPV), led a delegation to France in a much-anticipated trip for bilateral ties. The official visit by the party chief was rich in symbolism and saw both sides attempt to make substantive progress across the bilateral relationship in spite of remaining challenges. As I have noted before in these pages, Vietnam and France have a long historical relationship, with France colonizing Vietnam as part of French Indochina and ruling the country until its defeat in the First Indochina War and the proclamation of Vietnamese independence in 1954. Contemporary ties were formalized in 1973, but it was only much more recently that we saw an acceleration in the overall trajectory of the relationship, with the two sides proclaiming a strategic partnership in 2013. The boost in ties makes sense for both sides both in terms of bilateral ties as well as their broader foreign policy. France sees engaging Vietnam as part of a broader effort to enhance its engagement in the Asia-Pacific and Southeast Asia and ASEAN more specifically, while Hanoi views boosting relations with Paris as part of its foreign policy objective of engaging multiple major powers, including the five permanent members of the United Nations Security Council. 2018 represents a key symbolic year for the relationship, with it being both the 45th anniversary of the establishment of diplomatic ties and the fifth anniversary of the inking of the strategic partnership between the two sides. As is often the case for diplomatic relationships, these anniversaries have provided an opportunity for the countries to further step up their collaboration across a range of areas. From March 25-28, Nguyen Phu Trong led a delegation to France amid these commemorations for a series of high-level meetings including with President Emannuel Macron, Prime Minister Edouard Philippe, Senate President Gerard Larcher, and National Assembly President Francois de Rugy. The official visit, which was Trong’s first visit to Europe since assuming a second-five year term as general secretary of the CPV in January 2016 and the highest level meeting between both sides since Macron came to power, was rich with symbolism. Both trong and Macron touched on the historical evolution of the relationship in their remarks; Trong also visited Montreuil, where he laid a wreath at the statue of the late Vietnamese revolutionary leader Ho Chi Minh. Substantively, as was expected, the joint statement by the two sides specified both recent steps that had already been taken in advance of the visit as well future steps they intended to take as well across the economic, defense, and people-to-people realms as well as on regional and global issues. Several agreements were signed in areas such as science and technology, climate change, and intellectual property, and both sides also agreed to expand the architecture of dialogues within the bilateral relationship as well. To be sure, the focus on the visit itself should not obscure the significant challenges that remain. For all the rhetoric, ties are still quite undeveloped in some areas – on trade, for example, France only accounts for about 1 percent of Vietnam’s total exports and imports. There are also constraints on the further development of ties, including human rights issues that continue to be a concern and the reality that France is only one of a long list of countries Hanoi is looking to engage. Yet Trong’s trip was an opportunity to make further inroads in realizing new opportunities and overcoming old challenges, and given the commemorations this year, one can expect both sides to continue to undertake such engagements through 2018. What’s Behind the New Vietnam-France Defense Pact? A closer look at the significance of the new joint vision statement inked by the two sides. What’s Next for Vietnam-France Military Cooperation?Philippines-France Defense Ties in Focus With New Patrol BoatsWhat’s Behind France’s First Vietnam Air Force Mission?What’s Next for Singapore-France Relations in 2018?Where Are Vietnam-France Defense Ties Headed in 2018?